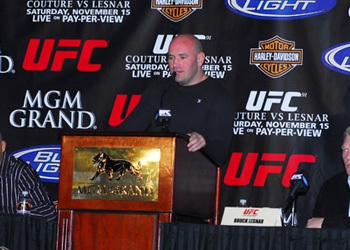 UFC president Dana White is planning a massive east coast invasion in early 2010 for the UFC. If White gets his way, which he normally does, look for Boston, Toronto and New York to be hosting Octagon events this time next year. “I’m pretty confident we’re going to do an event in Boston, Massachusetts, at the Boston Garden in November,” White matter-of-factly stated. The NBA champion Boston Celtics and NHL’s Boston Bruins currently call the building home. Although it’d be pretty wicked for the Boston-born White to host host a UFC show in his home town, imagine how crazy a UFC Octagon would look under Madison Square Garden’s famed spotlight. White has been envisioning it, in fact, he has had his sights set on the Big Apple for quite some time. “The first of the year, (we want to do a show in) New York, and I’m hoping we have Toronto done before New York,” White said. New York and Boston were the initial two beasts that White wanted to tame, however since he made his return to Montreal, Canada this week for UFC 97, he has been bombarded with the Canadians’ request for a promotion in Toronto. Currently, MMA is not sanctioned in the state of New York or Massachusetts.